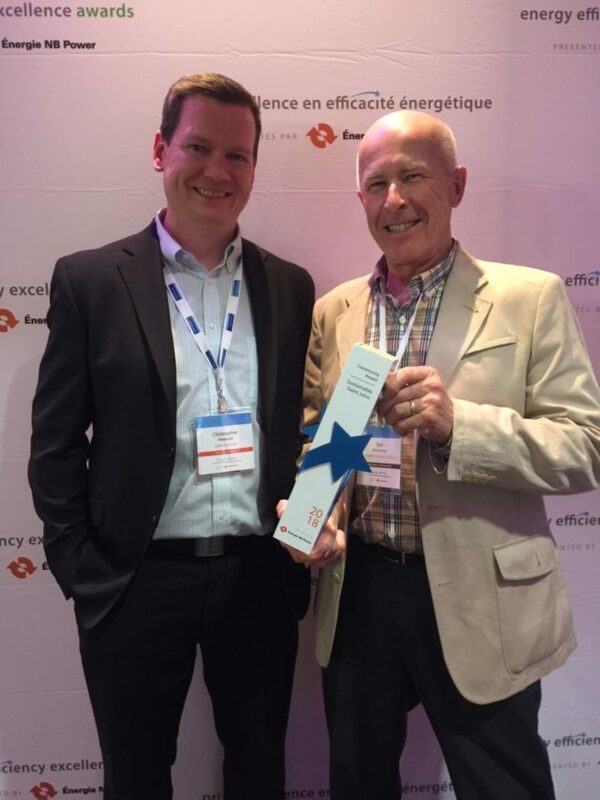 Last week, the NB Power Energizing Efficiency conference and Energy Efficiency Excellence Awards were held in Fredericton, NB. Sustainable Saint John was honoured to have received the Community Award and was represented by board members who attended the conference to gain some valuable insight into the energy efficiency community in Atlantic Canada. We sat down with two of our volunteer board members –Chris Peterson (Anthesis Group) and Megan Scott (Commercial Properties) – who attended the conference, to share their thoughts on the event. (Q) What was your overall impression of the event? (A) It was great to see the scale of interest and enthusiasm around energy efficiency. There were around 200 attendees representing organizations from regional utilities, businesses, service providers, students, educators and government. There was a great mix of panels and presentations with something for everyone- residential, commercial and industrial. (Q) What were your key take aways? (A) Our first take away was the level of commitment from NB Power to drive the adoption of energy efficiency. This was clear from the event but emphasized by Gaëtan Thomas in his award ceremony statements where he promised to show even more progress this time next year. The second thing was the links between energy efficiency investments and their links to jobs, local economic development and economic growth. For instance the keynote speaker Stephen MacDonald – CEO of EfficiencyOne – quoted a report that for every $1 invested in energy efficiency it leads to $7 in GDP growth. Finally what stood out for us was that the knowledge, solutions, and financing are in place but as a community we are still struggling to ‘sell it’ and reduce the friction to adoption. (Q) One of the themes of multiple talks was inspiration – what inspired you? (A) The awards were really inspiring. It was great to see the diverse groups and individuals contributing to sustainability across the province including Sustainable Saint John, that was recognized with the Community Award, and SSJ Member NexGen, who was awarded the project of the year award. One group that was talked about a lot and also recognized was The GAIA Project that is playing the long game by going into schools to teach kids about sustainability through experiential learning. (Q) Any actions that you’re going to take coming out of the conference? (A) Given SSJ’s vision of ‘creating a culture of sustainability’ it is always great to see and participate in events like this that are contributing to that end. It was also great for SSJ to be recognized for it’s contributions through the community award. It’s a real testament to all of our members, volunteer board members, founders and funding partners.